Entry doors are a big part of your house’s curb appeal because they are one of the first things your visitors notice when they come to your house. LLuminare Doors and Windows offers a wide variety of styles, and custom doors that can elevate the entry to an art form. The perfect front door will also greatly increase the value of your home. In today’s world, wooden doors can still be the standard choice, but the advances in technology when it comes to fabrication of materials and customizing a certain design, customers have metal and fiberglass options as well. The fiberglass doors found in today’s market are truly unique in style and quality. If you need the look of a wooden door without all the hassle in maintenance, you will be pleasantly surprised how these composite doors will do the job just right for you. 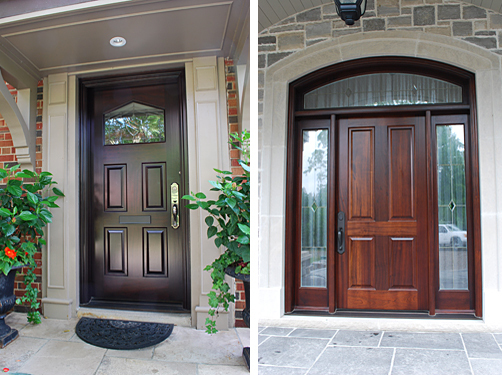 When you need a front entry door for your home, you have three different options to choose from: wood, fiberglass or metal. At LLuminare Doors and Windows, we offer the best custom designed front doors in Orange County. Our stain-grade hardwood doors continue to impress our customers because they put a warm and welcoming touch to your house. Wood is a popular choice of material, offering the most options for customization like carving or a certain type of color and finish. However wood requires a little bit more maintenance compared to other materials. It is susceptible to the effects of the sun and weather. In order to delay or stop its deterioration you need to know how to care for them. If you live in an area where there are harsh weather conditions, wood entry doors might not be your best option. One way to care for them is to install an overhang protection. It is inevitable that in time, wood doors, due to exposure to sun, wind and rain will deteriorate. You will see the colors fading, wood splitting, warping, joints separating. Wooden doors usually require re-finishing every two years. uPVC doors, or as we call them today composite doors, have the look and feel of real wood. The best thing about these doors is that they require a lot less maintenance than wood doors. During the fabrication process, they get their wood like finish. Wood door molds are used during this process to make these doors look more like wood and less like fiberglass. With this material, you won’t experience problems like bowing, rotting or warping, and composite doors will never have to be refinished. They can be customized just like wood doors. Aluminum doors definitely add a certain level of security to your home you might be pleasantly surprised to see the variety of looks and styles available in the market. Aluminum doors are very durable. They are certainly heavier than other door types and they require extra hinges and a special multi point locking system. Metal doors will add to your home’s value just like wood or uPVC doors, and they require little maintenance as well. When you order custom entry doors from LLuminare Doors and Windows, you will receive the highest quality doors in Atlanta GA with unmatched customer service. At LLuminare Doors & Windows we offer not only front entry doors but also garage doors, windows and window treatments. Give us a call for a free consultation and estimate, or visit our showroom to see our catalog. Our company produces and installs aluminum doors. When manufacturing we use profiles from the world's leading manufacturers - Reynaers and Alutech concerns. Our company offers a lot of additional options for your garage doors. Thank You! We'll call you back shortly!